At a time of uncertainty in the global economy, it is time to examine accepted economic theories. This is why Dr. Jacky Mallett introduced a very simple simulation of a one product economy with a constant money supply. Working with established equations, Dr. Mallett began questioning theories at the heart of the field. The results of her simulation have revealed that even the simplest economy has complexities that economists do not fully take into account, and that the market can behave in unexpected ways. Dr. Mallett plans to expand this simulation to include debt and a model banking system. Ideally, this project will provide a platform for experimentation and the development of improved economic theories for practical application. This presentation is part of a series of presentations that were held on IIIM Open Day last spring. 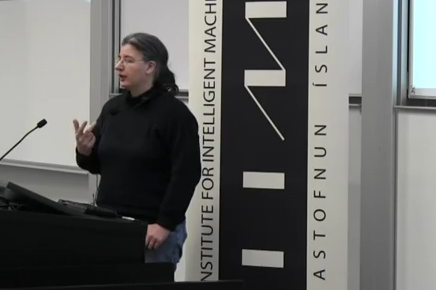 This year IIIM Open Day was held in collaboration with Reykjavik University’s Center for Analysis and Design of Intelligent Agents (CADIA), one of its closest collaborators, making for very impressive and interesting presentations. Previous PostDr. Kristinn R. Thórisson Keynote Speaker at the Workshop on ACCSDSNext PostIIIM Newsletter-Issue 2 Out Now!